Leilani Munter is a race car driver, environmental activist, vegan and animal rights activist. Leilani uses her sport and platform to advocate for both animals and the environment. 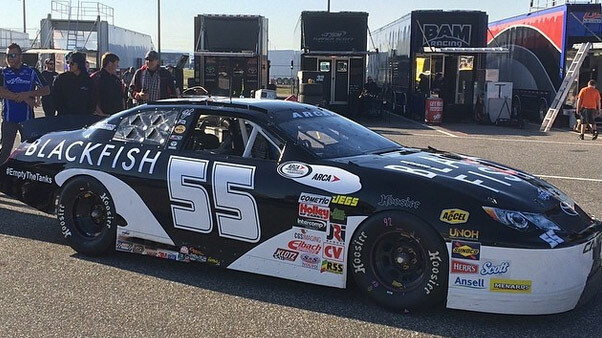 At the ARCA Racing Series event, she raced in a car designed to look like the orca whale Tilikum, featured in the documentary film Blackfish, and make a statement about Sea World and other animal abusement parks. Leilani was born and raised in Rochester, Minnesota, earned a degree in Biology from the University of California San Diego, and currently resides in Cornelius, North Carolina. Leilani is a great example of how anyone can use their skills and talents in support of animals. Here is someone blazing a new trail in animal advocacy by bringing the ethical vegan message to professional auto racing. How did you come to racing? There are still so few women who race professionally that it must have seemed like a longshot to realize your dream. Do you feel pressure to be a role model for young women? I went to a racing school as a bucket-list item and ended up being a second faster than anyone else there. It was a long shot, but I’m glad I took that risk. I still earned my degree in biology, so I had a career to fall back on. But the reality of it is, I have a much louder voice as an activist with a race car than I would if I wasn’t a racer. Racing is what gives me the ability to reach millions of people with these messages. You’ve been vegetarian almost your whole life, and now vegan since 2011. What was that like growing up and how did you come to veganism? I first went vegetarian when I was six and found out what meat was. I have now been vegan for over three years. I remember the hardest time for me was when I lived in the dorms at the University of California and I had to eat in the cafeteria there. It was the same food over and over. I would constantly have the workers at the cafeteria say, “Oh, you are vegetarian? But you eat chicken right? And fish?” and it was just so frustrating. I went vegan three years ago because the more I learned about the dairy industry, the more I knew I had to go vegan. I am happy to eat and know that I did not harm any animals for my food. How did you shift towards being an animal activist? What are some animal exploitation issues that are important to you and how can people help support those projects? I work as a volunteer for Ric O’Barry’s Dolphin Project and I work with the Oceanic Preservation Society, the makers of The Cove. I am filming a new movie with OPS called 6 that will come out next year. You can support Ric O’Barry by going to dolphinproject.org and you can follow the new film at 6themovie.com. How did the car’s sponsorship by Sam Simon come about? You were running a crowdfunding campaign for a while trying to raise the funds for your Blackfish car. I was a guest on Sam Simon’s radio show. He spontaneously decided to sponsor the car during the radio show. I was in shock, and by the time he transferred me to the producer, I was crying so hard I couldn’t give him my cell phone number. He had to wait till I gathered my emotions! I just couldn’t believe it. Sam is so kind, so giving and is a hero to so many animals and people around the world. I am so honored to have spent time with this wonderful person. You received a nice amount of mainstream attention around your Blackfish car at Talladega. Were you able to accomplish what you hoped, both as a professional race car driver and in terms of the message? Yes, absolutely. Our mission was to get Blackfish in front of as many people as we could. We got some incredible TV coverage about the film, and we gave away free Blackfish DVDs to the race fans at the track. It was incredible. The Cove and Blackfish are two of my favorite films and I am so honored I was able to drive race cars promoting both of them. These movies are incredibly effective at getting people to understand why cetacean captivity is wrong. The more people that see these films, the less people will buy tickets to sea parks and the faster they will shut down. For those readers who are unaware of how important corporate sponsorship is to your ability to actually race for a profession, can you speak to this issue? Has your outspokenness on animal issues and environmental issues cost you corporate sponsorship? I cannot race without sponsorship; it is incredibly expensive to race these cars. But this is how I have a voice to talk to millions of race fans about these important issues. My activism in both the animal and environmental world have cost me sponsorships. I have walked away from a few multi-million dollar deals because I didn’t agree with the company policies. My rule is that I do not work with any of the following: no fossil fuels – no oil, no coal, no natural gas, no meat or dairy products, no companies that test on animals or have fur or leather in their products. When I give that list to marketing people, the typical reaction is “You just listed about 90 percent of my client base. I don’t know how to help you. Good luck.” So I have been doing my sponsorships on my own for a long time. It’s been a long and difficult journey but when I get to drive race cars carrying messages, I want to scream to the world, it is all worth it. 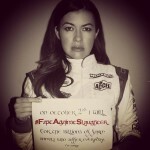 How do your fellow racers and colleagues feel about your veganism and environmentalism? Are they supportive, dismissive? Both. Some are accepting, some make fun of me, some are defensive about their choices to live a different lifestyle. I find that once they learn about clean energy or try my vegan food, their minds start to open. The key is starting the discussion. If we only talk to those who already believe in the same things we do, who is going to change the minds of those who don’t? You purchased a Tesla last year as a way of promoting electric cars. As an electric car owner, a 2012 Nissan Leaf, I absolutely love the technology. What do you hope the public gets from your message? I recently drove from my home in Charlotte, NC to my race in Chicago, IL in my Tesla. In doing so, I became the first driver to ever get to a race oil-free to compete . I did it because I wanted to show people that long electric car trips are possible today, thanks to the supercharger network Tesla has launched, as well as the vast amount of other EV chargers around the country that are becoming more and more common to see. I also want them to understand that when you drive an electric car, the money you spend to charge your car stays in the United States, versus when you fill up with gasoline a lot of that money goes overseas to OPEC. So it’s patriotic to drive an electric car. And, as renewable energy expands, our electrical grid gets cleaner, so that means electric cars get cleaner as time goes on. I use solar on my roof to charge my electric car.